Selected Villas for rent near Aquapark Chaweng (Koh Samui) - Contact us now! 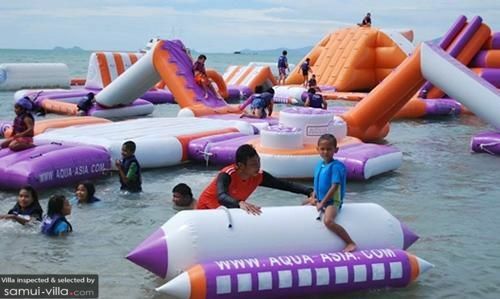 Take a break from the traditional water theme parks by venturing to Aquapark Chaweng, where all the action takes place in the ocean. A variety of large and small inflatables float about on the sea, beckoning out to thrill-seeking holidaymakers. The wet and wild fun at the Aquapark is suitable for visitors of all ages. Vacation makers in a laid-back mood may lounge about languorously by the beach, arming themselves with an array of delicious snacks and refreshing beverages.